The number of flags flown over Motherwell Civic Centre was the subject for extensive debate at last week’s meeting of North Lanarkshire Council. 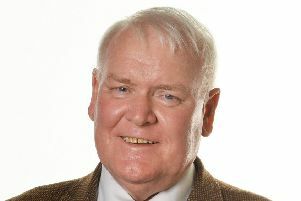 Conservative councillor Trevor Douglas raised a motion calling for the Union Flag to be flown at the council headquarters on all days, alongside the Saltire. Councillor Douglas said that this would be a mark of respect to Scottish war dead. He added: “This year is the centenary of the end of the First World War in which 100,000 Scots died fighting for that flag. Labour councillor Heather McVey tabled an amendment to install a fourth flagpole, which was incorporated into the motion. This will allow permanent flying of the Union, Scottish and council flags along with the occasional flags. The SNP group proposed an amendment to continue existing flag protocols, tabled by Councillor Jordan Linden. He said: “The council’s protocol was determined by Scottish Government and the Scotland Office, I am somewhat perplexed by this call for another flagpole. The motion was granted by 35 votes to 27. The new flagpole will be attached to the side of the building at a cost of £185 plus VAT, and will be used to fly the council flag.